So you want to buy a sitar? Over last few years I’ve received many requests for information on where and how to buy a sitar. Of course I can’t blame you guys. The first time I heard the instrument live I fell in love with it and obsessed over how to wrangle one up. Well, there are several factors to consider before you make that purchase on ebay. Here are a few things to look out for. Sitars come in two basic styles. The most recognizable in the West (though this is debatable) is the Ravi Shankar style, or Kharaj Pancham. 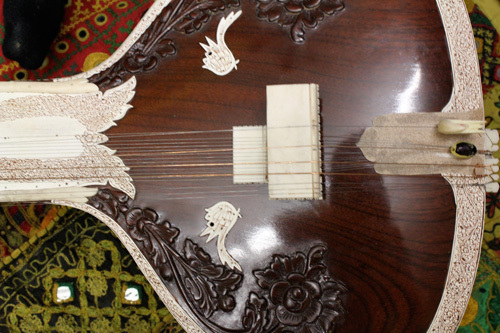 This instrument has 7 main playing strings, which include one Ma string (the 1st string), a jora string (2nd), two kharaj strings (lower octave strings), and three chickari strings (used for rhythm ornamentation). There are typically 13 sympathetic (taraf) strings on a sitar, though depending on the model there could be 11. It is the low kharaj strings that truly distinguish the sound of the instrument. Ravi Shankar originally worked with instrument designers to combine the range of the traditional sitar (6 strings) with the lower range of the sur bahar, a larger cousin of the sitar. As a result the range of the instrument was expanded by an additional octave. You can hear these lower notes in many recordings from the maestros of the Maihar gharana (school)–in particular those from Pt. Ravi Shankar and Pt. Nikhil Banerjee. These instruments also usually come with a second toomba (gourd) that screws onto the end of the neck. 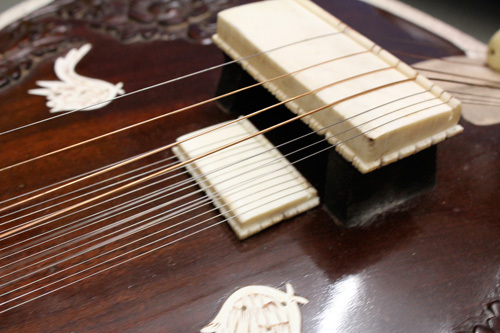 The sitar bridge is flat with a very gentle curve that creates a specific sound. The sound can be adjusted by filing this curve. The other distinguishing characteristic is the jawari, or filing of the bridge. 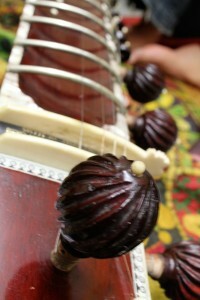 These sitars have a jawari that is traditionally more open, giving a sound that contains that typical sitar buzziness. Depending on where you purchase your instrument, you may be able to request the maker re-file the jawari to suit your taste, as this can dramatically change the sound of the instrument. These sitars come in 3 qualities, categorized as either Number 1, Number 2, and Number 3. Number 3 sitars generally are very basic, with only 11 sympathetic strings and minimal decoration and carving. The pegs are also more simply carved, usually in the shape of a twisted ball. Number 2 sitars have a bit more carving and a little more in terms of decorative pen work along the neck of the instrument, and they usually have 13 sympathetic. Number 1 sitars are the fanciest models, fully carved, with delicately and deeply carved leaves and vines that run from the main toomba (gourd) to the base of the neck. The main pegs are usually in the shape of rosettes or flowers and there is decorative pen work that runs the length of the neck. They also typically come with a large 2nd toomba that screws on at the far end of the neck behind the nut. Typical Vilayat Khan Style neck and pegs. The second main variety of sitar is the Vilayat Khan style, or Gandhar Pancham. These sitars are very simply carved and instead of decorative pen work, they have synthetic mother-of-pearl inlays that run the length of the neck. They also have only 6 main strings, 4 chickari (rhythm) strings, 1 Jora and one main string. The second of the 7 main pegs is left empty, so there is quite a bit more room between the Ma string and the Jora, which some musicians prefer. The instrument has 1 less octave than the Ravi Shankar style, but it is not missed by the maestros of the Imdadkhani gharana, from whence the instrument came. The jawari is usually more closed, so the sound is less buzzy and more crisp. There is a range of quality among these instruments, though they are harder to spot with the naked eye. Usually you can tell a student model from a concert sitar by how many sympathetic strings it has, but really it’s about the quality and age of the wood, and the range of the meend (how far you can pull or bend the string to hit other notes). Most people who’ve asked me about how to buy a sitar are just starting out. They don’t want to break the bank on something they may not commit to for the rest of their lives. I can understand this point of view, however there are a few things to consider. First, there is a huge difference between a $300 sitar and an $800 sitar, and it could have a direct impact on your decision to want to play the instrument or not. My first instrument was a $300 model, very basic but it sounded cool and I was happy. At the time I wasn’t taking any lessons and I would just play whatever I could pick up by ear, but it was a bit frustrating. Although my sitar sounded kind of like George Harrison’s, I couldn’t come anywhere close to making it sound like Ravi Shankar’s. Granted most of this had to do with my inability to really play it, though there were many things that the instrument simply couldn’t do. For example, if I tried to bend the string by pulling it across the frets, the other strings would go out of tune. The other thing I noticed was that the sympathetic pegs wouldn’t hold in place and in an effort to tighten one of them, I inadvertently drilled it right through it’s hole in the neck, like a screw that had been stripped, and it would no longer stay in tune. A few years later I decided to upgrade and the difference was extraordinary. Suddenly, the sympathetic strings were ringing while I was playing the main string (which never happened on my old instrument), and I could pull the string much farther, hitting notes up to four steps up the octave. The wood and construction was much more solid and there was no fear of stripping any of the sympathetic pegs. Mainly, it sounded so much better, and as a result, I loved playing it. I began practicing much more (at that time I had also found a teacher) and it became a major part of my life. I’m not trying to talk you out of buying a sitar if $300 is all you can afford. If you really want to play, get it. But here are a few things to look out for. This is the tabli of a modern Hiren Roy sitar. It has ornate carving that is clean and somewhat deep. Older models have even deeper carving. 1. Depth and clarity of carving: the carving should be clean and deep. Most sitars have a carving on the face (tabli), and it should look clean without stray scratches or divots where a carving knife might have slipped. There should not be a rough halo around the carving as this is a sign of poor craftsmanship. 2. Older is (almost) always better. Wood warps over time, that is why the best instruments are made from well-aged tune wood (Indian mahogany) or more rarely Burmese teak. If an instrument is older, its wood has had a chance to settle and whatever warp would have become apparent by now. Also older instruments tend to be well constructed, as mass production is a recent phenomenon for sitars, having gotten underway only in the late nineties. Any instrument from before this period should be hand-made by a skilled maker with a good deal of attention to detail. That being said, any instrument picked up from a tourist trap or souvenir shop in India at any time in history is very likely just that, a souvenir not fit for playing. Hang it on a wall somewhere for decoration and go buy a real sitar. Quality new instruments are made form wood that has been aged for many years to the wood has already done it’s warping and it’s moisture content is stable. There are many very good sitar makers around today making stellar brand-new sitars, but to find them you have to go to their shops in India or to a reputable dealer. I will list some dealers in America further down. 3. Meend. I cannot stress the importance of this enough. Your sitar should have good meend (ie. the ability to bend or pull the main string for a wide range of notes). Sitars are designed to maximize meend. It is why the main string is positioned at the halfway point of the width of the neck,to allow room for the string to be bent. It is the meend that gives the instrument its vocal quality and allows the player to smoothly transition from one note to another and do complex ornamentations while remaining on one fret. The best sitars have a meend range of five steps. So from the Sa fret they can pull from the tonic note to the Pancham note (the fifth) with ease. If you don’t have the callouses or skill to pull this off, ask the dealer to demonstrate it for you. If the string doesn’t reach the fifth before sliding off the fret entirely, keep looking. 4. Sympathetic response. The taraf (sympathetic) strings are there for a reason. When tuned to the scale of the raga you are playing, they should ring out and add resonance and volume to the sound. It is said that a properly tuned sitar has so much resonance that it almost plays itself, reacting to the slightest touch of the musician. Always ask to play an instrument, or have someone demonstrate it, before purchasing, and listen for the sympathetic strings to ring when you hit certain notes. They should be distinct, magical sounding emulations that vibrate beyond the time the plucked string has come to rest. Of course, try to have the dealer tune the sitar for you first, as the stings will only respond if they are tuned to the notes you are playing. The back of a Number 1 Ravi Shankar style sitar. This one is 35 years old made by Radha Krishna Sharma. 5. Finish. Look for cracks in the gourd and impressions on the finish that are out of place. Some mass produced models are made so quickly, they are shipped off before the finish has a chance to dry. This leaves telltale blemishes in the polish. This won’t affect the sound so if it means the difference between getting a cheaper instrument or nothing at all, you may still consider it. It is the sound that is ultimately most important, and minor surface blemishes can be polished away. Almost all sitars have marks where the frets are tied. These are the result of the maker tying the frets before the finish is dry, and help indicate where he feels the best placement of the frets is. The frets don’t always line up exactly with these marks, so don’t worry if you see them, they are quite normal. 6. Frets. The frets should be nice and thick, and tied on tightly with thread. Cheaper sitars are tied with nylon fishing line, which is not very durable and doesn’t hold as tightly as thread. Depending on where you buy your sitar, you may be able to request that the frets be retied with strong thread. Any reputable dealer can do this for you if they are loose, and it is worth the extra $50 to have it done in the long run. The most important thing is that the frets are tied tightly and don’t easily slide and bend over when fretting the string. 7. Always get a case. Sitars are delicate and you need a hard case to transport them any distance. Padded gig bags are cheap and good for short trips in town, but a hard fiberglass case will truly protect your instrument. Keep in mind there are lots of pegs that could be damaged from knocking around in a train, bus or car, and if the bridge gets dinged and moves even a millimeter, the sitar will sound completely different and may be difficult to tune. By far the best place to buy a sitar is in India, but only from an established instrument maker. The best thing to do is to contact the maker up to 6 months before you arrive and place an order. They can make an instrument to your exact specifications, though they will require a deposit. Top quality instruments range from $600 to $900, though because you are a westerner they may charge you a little more. It usually helps if you have your sitar teacher or a local musician contact them and help you make your request, as they can communicate to the maker that this is for a serious musician and not just a tourist. As for makers, if you’re in Delhi, you can find good sitars from Rikhi Ram. Calcutta has quite a few excellent instrument makers, including Hiren Roy, Hemen, Monoj Kumar Sardar, and Mangla Prasad Sharma. Therse are the most well-known, but there are quite a few other makers around the country, so if you find a good one from someone not mentioned here, don’t worry. The same rules in selecting a quality sitar that I’ve mentioned above still apply. If you live in the U.S. there are dealers around the country with a good selection of instruments. Anywhere where you can actually go and play the instruments before you buy them is a good thing. 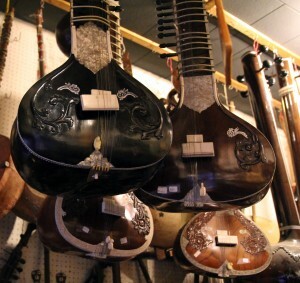 Sitar prices in the U.S. can range from $300-$4500 depending on quality. Concert quality instruments usually start in the $1500 range. In New York City, you can visit The Music Inn. They are a kind of living museum with antique and brand new instruments from around the world, including incredible, professional sitars made by some of the greatest makers who’ve ever lived. They are currently designing electric sitars of their own (they have already created a line of electric sarodes which can be seen here). If you are in San Francisco, you can visit the Ali Akbar School of Music. They have a store with a great selection of well made professional and student quality instruments. In Chicago, Andy’s Music seems to have a good selection. If you are shopping online, a good resource is Rain City Music, which recently joined forces with Sitars, ETC, another decent online store. If you are truly inspired to play the sitar, I would encourage you to do your research and try to find the best instrument possible. It could possibly decide whether you really learn to play the instrument or not. Good luck! Hey, You playing is great and loved the movie. I just saw one thing incorrect in the description of buying sitars above. A #1 sitar is the highest end model, and the #3 is the low end model. You have that reversed in the article. Hope that helps. Thanks a lot. This was really informative. Thank you so much for your knowledge and opinion! I’ve fallen deeply in love with this stringed beauty, but am quite lost in terms of where and how to start playing someday. There are no sitar teachers nearby, nor any music stores that have sitars. So, any info like this helps. 🙂 Thanks again! What model of sitar do you recommend for a first time student? I am a big fan of Ravi Shankar, so I’d prefer the Kharaj Pancham style. But what maker would you recommend? Thank you for the info! Are there any shops you would recommend in Mumbai? Is definitely the best quality professional sitar shop out there for people who wants to buy a sitar but they can’t go to India. Thank you and keep up the nice productions ! May you recommend me any ebay.com Sitar around 600~700 USD? Thank you so much for taking out the time to write about what aspiring sitar learners should look out for as we begin on this journey. It was a huge help! Good Luck for all your endeavors! Not sure what you mean by “soften the strings.” It takes some time for a new string to get settled and it will tend to go out of tune easily for a few days after a new one is installed. I usually pull or bend a new baj (main string) across the frets many times to stretch it out when I first put it on. I am inn London and recently I brought my sitar from India in hard fiberglass case. But unfortunately one string has snipped off. Now where in London can I buy a single sitar string? Buying a single string or string set is pricey. The best bet is to buy coils of music wire (I have previously posted the gauges on this site, and you can look them up online as well—just do a google search for music wire). You can usually find this wire at music stores or order them online. The wire is typically used for harpsichords and dulcimers, so any stores that sell those should have wire coils. It is better to buy the proper coils as strings break regularly, and one string may only last you a few weeks/months. Do the same threats of poor quality apply to other instruments such as tanpuras, and sarods? Yes. Sarods are particularly delicate as they have a skin on the face that is effected my moisture and humidity. Getting these from a respected dealer or maker is essential. Tanpuras are similar to sitars in their construction and really fine ones sound amazing. It is certainly worth digging around to find a good one. Basically all Indian instruments are hand-made, and many are catered to a large, foreign (outside of India) consumer base, and that means there is a wide variation in quality. I have heard Resin based sitars are better for sound and durability, is this correct? I have yet hear a sitar made from composites, but I suspect they could sound great if made properly. The cellos and violins made from carbon fiber suposedly sound phenomenal. There are just very few sitar’s made from this material. I’d be curious to hear one. Thanks for this information, I am a student and I am planning to buy a sitar so please suggest me a cheap ‘n’ space saving sitar. Hello thank you for very good article on buying first sitar. Can you recommend any sitar dealers in the Los Angeles area? Hi Michael, it is common for some sitars to not have a label or maker badge on them. Usually this indicates it is of lesser quality I’m afraid, however I know some with unmarked sitars that sound wonderful. These days sitar bodies are mass-produced as rough blanks that are then purchased by sitar makers who further carve the instruments and add the pegs, frets and final finish. Sometimes these can be well made as a special order by a lone maker, in which case a label may not appear. Unfortunately, this is much less common, and for the most part these sitars represent cheaper instruments sold in the tourist areas of India. Jam on everyone. Have a good one! Hi,Been playing various guitars,basses,mandolins,tablas for nearly 40 yrs.I’m interested in taking up sitar.Are there any dealers in Australia ? Tom. Thanks for very useful information. It is a very tough decision to make which one would be the best and economical at the same time. Specially, when buying for a beginner. Definitely keep the checklist when buying a sitar. Hello, I would like to buy a sitar in the site elsitar.com have any one of you knows about it? is it good? thanks in advance. 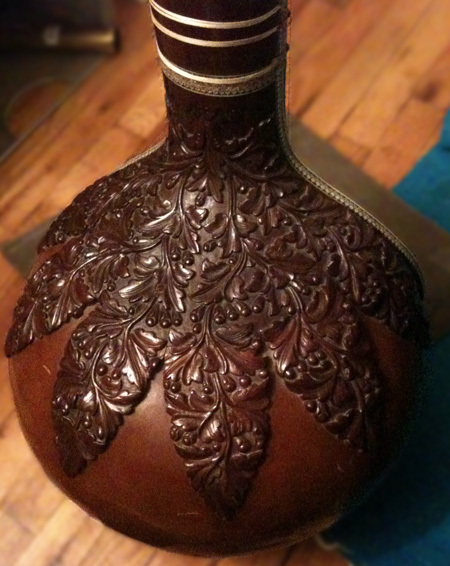 Just wanted to alert you to this beautiful, full-size “female” tanpura from Hemen & Co. (India) I am offering at eBay for a really great price (see attached photos). This is an especially superb instrument to accompany vocal music. Hi, i am a guitar player and i was thinking about getting a sitar, but I have a budget of 300 $. I would be weary of this instrument. First, this is one of the new style acoustic/electric sitars, and in my experience they typically are not very well made, especially at this price point. They also have a small, very shallow body and acoustically won’t be able to make much of a sound. Granted you can plug this into an amp, and that should help, but it’s hard to say whether you will hear much sympathetic response or if the bridge is well filed. It also does not appear to have a maker label on the neck (these usually are between the two bone nuts at the top of the neck. These typically are mass-produced with very little attention to detail. The carving may look nice in the photos, but unless you can see it in person it’s hard to vouch for the quality. Unfortunately it is rare to find a sitar that sounds good for under $700, and if they don’t sound good it’s much less fun to play. indian Instruments And Mojor Artist Buy From them . Their Shop In Varanasi Is almost 40 Years old . Thank you for this pertinent and detailed article. Would you havé any advices for taking sitar courses anywhere in India as a begginer? Any référence or areas where it would be good to search for sitar teachers? As a guitar player who thought he would grab a sitar whilst in India, you have really made me rethink. I will spend a little more time doing my research and a decision due to your advice. Many thanks. Hi, I am looking to buy a basic, possibly student model of Sitar whilst in Delhi for my son who is a guitar player in the UK, something of reasonable and playable quality but at the lower end of the budget scale. I will also need a hard case for transportation back to the UK. Perhaps you meant NR 15,000? I would at least have a salesperson tune it up and play it so you could hear it, but usually with the cheaper “student” models, you get what you pay for. I’ve tried “professional” sitars in some shops and they are terrible. I would at least stop by Rikhi Ram, there’s one in Connaught Circus and at Gole Market (owned by competing brothers). Their student models may be a bit better. ‘A Cricket in th Court…’ Now Available on Demand! So you’ve found a Sitar. Now What?